By the time your child reaches 3 years of age it is likely they will have had at least 1 episode of illness that involved a hearing infection. In fact, they may already have had recurrent middle ear infections. Although most children will exhibit signs and symptoms that are impossible to ignore when they contract an ear infection, sometimes the infections are not characterized by pain, but they can nevertheless have an impact on your child’s speech and language. Ear infections will commonly decrease a child’s ability to hear clearly and if they are not addressed quickly, they can have a larger impact on their overall speech and language development. Speech and language play an important part of your child’s development and if they miss hearing words, due to hearing loss caused by ear infections, they can start to fall behind. If your child develops a middle ear infection very early in their babyhood, then the chances are that they will be more susceptible to recurrent ear infections. Ear infections that include middle ear fluid can have a dramatic effect on your child’s hearing and this type of hearing loss is more difficult to detect. Tugging at the ears: This can be one of the early warning signals. 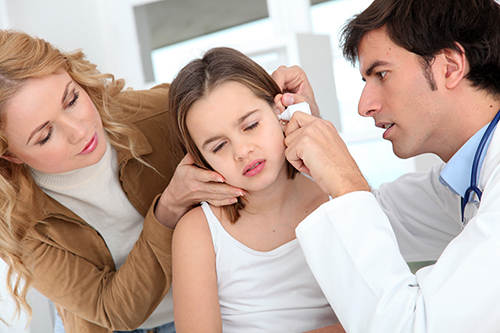 Your child may not be suffering pain, but there may be some irritation in the ear that should be checked out. Restless nights: If your child is normally a good sleeper and they have developed a series of restless nights of wakefulness and/or crying, then this could be an indication of an ear infection. Of course, it could also be something else too, but whatever the reason it should be investigated. Fluid coming out of the ear: Sometimes you may notice fluid or even pus coming out of the ear. This would indicate something quite severe, such as a perforated eardrum. This would most likely be accompanied by crying and pain and grabbing the ear as well. Mumbled speech: You may notice that your child speaks less clearly and tends to mumble more than they did previously. This can be due to an ear infection affecting their hearing ability. Bedtime crying: Sometimes lying down can have an effect on a child with an ear infection as the change in pressure in the middle ear is more noticeable. Of course, they may just not want to go to bed! Reduction in appetite: Ear infections can also affect the tummy causing a reduction in appetite or even diarrhea and/or vomiting. Ignoring sounds: If your child starts to ignore noises or sound s they usually respond to then that could be an indication of an ear infection, especially if it is also accompanied by repetitions of asking “what” or “huh?”. If in doubt about an ear infection, you should consult an ENT specialist, even if your child does not display pain, crying or fever. If a silent ear infection is allowed to continue it can affect your child’s hearing and may even lead to permanent diminished hearing or hearing loss. ← Why Do Children Snore?